Evening visit until midnight close. Original intention was to have just one but that subsided once I had tasted my first. Evening visit until midnight close. Some still here from the earlier quiz night, but very few. Late evening visit. The Fire Brigade's visit to the alley last week was due a fire in the next door dry cleaner's shop. Evening visit until midnight close. Everyone seemed to have left as soon as the weekly quiz was over. Late evening visit. Deep conversation about how to solve the housing crisis. Late evening visit. Always a pleasure to look around at the venue's delightfully distressed physical state. Late evening visit. Sparse custom tonight. Late evening visit. Good seated crowd and few at the bar. Late evening visit. Good chat with a postie about the forthcoming possible strike and about life in general. The pub is found in Catford, Greater London, SE6 4SP. 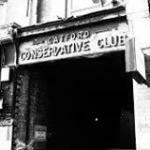 Formerly the Catford Conservative Club located at the south western end of Catford Broadway. Entry is via an alleyway. Conversion to a pub by Antic and a timely opening expected in late 2013 after Antic's loss of stewardship of the Catford Bridge Tavern just down the road. Opened Thursday 28th November 2013 initially with bar facilities only with work on the kitchen still continuing. Eclectic furnishing of the very very very shabbiest chic variety but surprisingly with a massive chandelier fixed to some open raftered roofwork. Short bar counter sports 6 handpumps. Separate ground floor room added later. Cellar is at ground floor level in a room at the back of the bar. Mini baronial staircase leads up to first floor large loos. More uncovered plaster works on walls and high ceiling than you can poke a stick at. One wall adorned with framed Private Eye magazine covers. Lunch (Saturday and Sunday) and Evening (Tuesday to Saturday only) meals introduced in March 2014 extended to 7 days a week later. A rear garden was opened in July 2014, all part of the continuing development of this venue. In 2014 a rather large bare-boarded room for extra seating opened on the first floor. We have visited this pub 108 times, seen 261 different beers and tried 151 of them.